By Means Of My Avataric Incarnation here, I Have Given you My Divine Secret. And I Always Loved you (and every one, and all, and All). This is a book of stories — about human need and Divine Response. This is a book of testimonials — about mortal suffering and Miraculous Intervention. This is a book of devotion — to a Person whose sympathy is so great, not only does He Love everybody with unqualified, unobstructed feeling, He literally became everybody: comprehending all, embracing all, suffering all. And declaring, from His Universal Heart, I Am humankind. This is a book about humankind. About a soldier in Iraq, a woman going blind in Holland, a man on his deathbed in California, and how they — and many more suffering human beings like them — asked for and received the Love and Blessings of the Eternally Present and Omni-Present Divine Avatar, Adi Da Samraj. It is early morning at Adidam Samrajashram — the Hermitage Ashram and principal residence of Avatar Adi Da Samraj, on the remote island of Naitauba, in the Republic of Fiji. Sea turtles swim inside the reef, Pacific pigeons coo in the trees, and thousands of dew-drenched hibiscus flowers — red, yellow, and peach-colored — bloom on hundreds of bushes. In an office on the side of a steep hill is a woman who has just picked dozens of those flowers. She is a devotee of Avatar Adi Da Samraj and she is helping to organize the morning requests for His Blessing. She carefully re-reads the letters of request from each devotee, written on behalf of himself or herself, or on behalf of a family member or friend. She double-checks to make sure that she has received via email a digital photograph of every person involved in each request. When she is satisfied that all is in order, she prints out the letters and photographs, puts them in a folder, and, carrying the folder and a basket of flowers, walks down the hill to a wide lawn bordering the ocean, and then on to a suite of offices. She is quiet, respectful, intent — she is next to Aham Da Asmi Sthan, the home of her Divine Guru, Adi Da Samraj. On woven Fijian trays, she prepares the requests for presentation, one by one. She places the photos on the trays and offerings of flowers around the photos. Once the trays are finished, she carries them to the Glass Pear, the office of Avatar Adi Da. Then she enters an adjacent room, where two bowls stand on pedestals — they are marble bowls, covered with gold and silver leaf, and were gifts to Avatar Adi Da from His devotees, in gratitude for His Blessings. She fills each bowl with fresh water and carries them into the Glass Pear, putting them next to the trays. This is the water that Avatar Adi Da will use in His mysterious baptism of Blessing. The devotee then presents the day's requests for Blessing to Ruchiradama Quandra Sukhapur Rani, for her final review. She is the representative of the Ruchira Sannyasin Order — the order of formal renunciates who have consecrated their lives utterly to Avatar Adi Da and His Way, and who are the sacred cultural link between Avatar Adi Da and His devotees. Ruchiradama Quandra Sukhapur works in detail with every request, ensuring that each one is rightly prepared as a sacred offering to Avatar Adi Da Samraj. The requests are also reviewed by Avatar Adi Da's personal physician, who provides Him with a detailed medical report with each request for Blessing that involves a death transition, illness, accident, or other physical difficulty. Then, when Avatar Adi Da is ready, the trays and bowls are taken into His room by Ruchiradama Quandra Sukhapur. She sets the bowls before Him on a table that devotees have constructed specifically for the morning Blessing. And, one by one, she and the doctor read to Avatar Adi Da the letters of request, and answer any of His questions regarding the exact nature of the individual's circumstance. The trays are put before Him — trays with a photo of a devotee about to have surgery, or a devotee’s mother who has had a stroke, or a devotee's son who has been in a car accident. 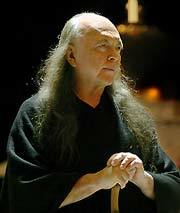 And Avatar Adi Da Samraj — His human body infused in every cell by the Conscious Light that is the fundamental substance of existence, His universal presence of Conscious Light surrounding and pervading all, His transcendental identity of Conscious Light utterly beyond space and time — responds at Heart to these suffering people, and Compassionately Blesses them. Dipping His hands into one of the bowls, He douses the photos with water, anointing them again and again. He may perform "laying on of hands" on a photo, touching a body part that a letter has indicated requires healing. He may place a flower on that area — or cover the entire photograph with flowers. He may rearrange the photos, as He did for a devotee’s eleven-year-old niece who was severely injured, surrounding her photo with the photos of her family, then moving His hands in slow circles above them. Avatar Adi Da extends His hands — and, universally aware, universally active, universally present, He extends His Divine, Compassionate, Miraculous Blessings. He does this every morning when He is residing in Fiji at Adidam Samrajashram . . . or when He is residing at the Mountain Of Attention or Da Love-Ananda Mahal or Tat Sundaram, His Hermitage Sanctuaries outside of Fiji . . . or when He is residing anywhere else in the world. And, as you will read in some of the stories in this book, Avatar Adi Da sometimes performs laying on of hands not only on a photograph of a person far away, but on the body of a person nearby — hugging someone, placing His hand gently on a heart or a head, or gently stroking a face. I begin each day by receiving requests for Blessing from devotees. Their requests are sometimes relative to difficulties of their own, such as health problems, or other matters. Sometimes they are requests for Blessing on behalf of people to whom they are somehow related. I am always given pictures of them. And something is said to Me about whatever is the problem, and what is actually being requested. This is what I do at the beginning of each day — give My Blessing-Regard to people and conditions of various kinds, using a visual association. I extend Myself through this Regard profoundly — I Intervene, I participate in the conditions in which people are suffering. And My Blessing does purify. It can be integrated with conditions in such a fashion that conditions are changed in various ways. This is how I Work.